english name "Poplar-loving Ringless Amanita"
1. Amanita populiphila, Colin Nesblett Wildlife Area, Colfax Co., New Mexico, U.S.A.
2. Amanita populiphila, Colin Nesblett Wildlife Area, Colfax Co., New Mexico, U.S.A.
3. Amanita populiphila, Turtle Crk. St. Pk., Pottawatomie Co., Kansas, U.S.A.
4. Amanita populiphila, Colin Nesblett Wildlife Area, Colfax Co., New Mexico, U.S.A.
5. Amanita populiphila, after heavy rain, Nebraska, U.S.A.
intro This species was originally described by Tulloss and E. Moses (1995). 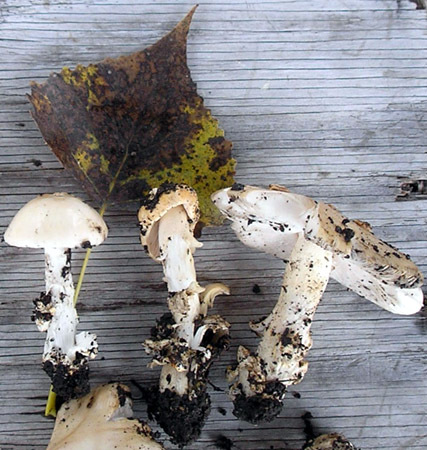 cap Amanita populiphila has a cap 30 - 120 (-135) mm wide that is white to off-white to pale tan or pale cream at first and becomes pale yellowish to straw-color to tan to brown with age and handling. It is broadly campanulate at first, then convex and broadly umbonate, and finally plano-convex in age with its margin uplifted. The flesh is 5 - 12.5 mm thick over the stem and is pure white, unchanging with cutting or bruising. The cap margin is striate (about 15% of the radius at first, becoming 20% to 40% of the radius).The volva may be absent or present as warts, small patches, or a single patch with extensive cracking on its surface. The volva is white at first and tends to change in color as the cap does (even occasionally becoming significantly darker than the cap); it is fragile, and easily removed. gills The gills of this species are free or narrowly attached, sometimes leaving very pallid orange vertical lines on the upper stipe; they are close to crowded and off-white to cream with pale orangish or pinkish tints in mass. In side view, the gills are white to various shades of cream and do not change when cut or bruised. Just after drying they are often a pale shade of pink or orange. They are 3 - 7.5 mm wide and have flocculence on the edge that ranges from concolorous to pale orangish white. Short gills are truncate to excavate-truncate, in several ranks, unevenly distributed, and common to plentiful. stem The stem of A. populiphila is 63 - 175 (-220) × (5-) 7 - 20 mm, white (sometimes with pale watery streaks), sometimes becoming pale watery brown after handling (but often not changing), and exannulate. The flesh is white to off-white and usually unchanging when cut or bruised (concolorous in tunnels made by insect larvae). There is a hollow central cylinder 2.5 - 14 mm wide. The volva is white (with color changes as on the cap) and more cup-shaped than sac-shaped. It is weakly structured and may break up into warts or patches on the lower stipe or simply come off the stem entirely during collecting (like a thimble) unless carefully excavated with the stem base. 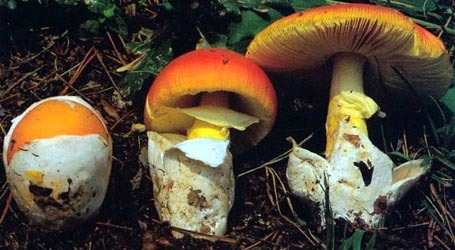 Amanita populiphila has a mild or insignificant odor at first that may become pungent in older specimens. The Moses family has eaten and enjoyed this species, they say the taste is mild and "pleasantly fungoid" except for the tasteless volva; and, in their preparation, the stem was "pleasantly crispy." spores The spores of this species measure (7.0-) 9.2 - 12.5 (-21) × (6.0-) 8.2 - 11.2 (-15.8) µm and are predominantly subglobose (occasionally globose or broadly ellipsoid) and inamyloid. Clamps are not found at the bases of basidia. author Tulloss & E. Moses. 1995. Mycotaxon 53: 455, figs. 1-4.
intro The following text may make multiple use of each data field. The field may contain magenta text presenting data from a type study and/or revision of other original material cited in the protolog of the present taxon. Macroscopic descriptions in magenta are a combination of data from the protolog and additional observations made on the exiccata during revision of the cited original material. The same field may also contain black text, which is data from a revision of the present taxon (including non-type material and/or material not cited in the protolog). Paragraphs of black text will be labeled if further subdivision of this text is appropriate. Olive text indicates a specimen that has not been thoroughly examined (for example, for microscopic details) and marks other places in the text where data is missing or uncertain. The following material not directly from the protolog of the present taxon is based upon original research by R. E. Tulloss. pileus protolog: 30 - 120 (-135) mm wide, white to off-white to Tilleul Buff (7.5YR 8.4/2.0), very pale tan (slightly darker over disc) or pale cream (with orange-brown tint over disc), often becoming yellowish (e.g., more cream than 5A2 with margin remaining nearly white) to straw-color to tan to brown with age and handling, tacky to subviscid to viscid (Smith 50210), shiny to dull, broadly campanulate, then convex and broadly umbonate, then plano-convex, in age with margin uplifted; context pure white, unchanging when bruised or cut, 5 - 12.5 mm thick at stipe, thinning evenly for up to four-fifths of radius, then membranous to margin; margin rather short striate at least at first (0.15±R), eventually with longer striation (0.2 - 0.4R) particularly in dry weather, frequently becoming rimose, nonappendiculate; universal veil absent or in often rather thick warts or small patches or as large areolate patch (Smith 84263), submembranous, fragile, detersile, off-white to avellaneous at first, unchanging or becoming yellowish brown or yellowish buff to pale brown to grayish brown to "very dark" (Trueblood 5472) in age or through drying or handling. lamellae protolog: free to adnexed, sometimes with long decurrent very pale orangish white lines on upper stipe, close to crowded, off-white to pinkish white to very pale orangish or pinkish cream in mass, cream to pale cream to sordid pale cream to white in side view, unchanging when cut or bruised, pale pinkish or salmon pink (Trueblood 5472) or pale orange to pale yellow-orange when just dried, 3 - 7.5 mm broad, with concolorous to very pale orangish white flocculence on edge; lamellulae truncate to excavate-truncate, in several ranks, unevenly distributed, common to plentiful. stipe protolog: 63 - 175 (-220) × (5-) 7 - 20 mm, white, sometimes with pale watery streaks, not discoloring or becoming watery pale brown over time or from handling, narrowing upward to subcylindric, flaring slightly or not at all at apex, decorated in upper half with very pale orangish white flocculence, finely striatulate; context white to off-white (with watery streaks), usually unchanging when cut or bruised, sometimes sordid in lower stipe or pale tan in universal veil below stipe base, concolorous in larva tunnels, stuffed in whole or part with white cottony fibrils, becoming hollow, with central cylinder 2.5 - 14 mm wide; exannulate; universal veil as "thimble-like" cupulate volva, submembranous to membranous, thin to 3.5 mm or more thick, white, changing with age and drying as on pileus or taking on orange-red or brown spots in lowest portion, easily detached from stipe in mature specimens, frequently also as warts (separate or confluent) unevenly distributed along stipe or in rings around stipe and having form like that of warts on pileus. odor/taste protolog: Odor none (Smith 50210) or mild and pleasantly fungoid or pungent (Smith 84263) in older specimen. Taste mild and pleasantly fungoid in all parts except universal veil (tasteless). EDIBLE (with caution) and good with exception of unavoidably gritty universal veil [per E. Moses—ed.]. 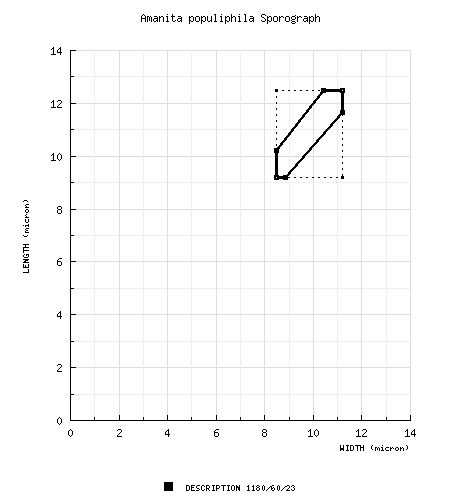 tests protolog: Paracresol spot test for tyrosinase - for freshly collected material, rapidly positive throughout basidiome in specimens of all stages of development; in material collected 26 hours before testing, reaction took 5 min. Syringaldazine spot test for laccase - negative throughout basidiome with exception of exterior surface of undried portions of universal veil at stipe base and there rather rapidly and strongly positive (reddish lavender instantly or in less than 1 min., deepening to near ruby red). 95% ethanol (control for syringaldazine test) - negative in all parts. KOH - negative on pileus and lamellae. NH4OH - very pale yellow on context throughout basidiome. Test vouchers: holotype and Moses 1.
pileipellis protolog: with rather extensively gelatinized suprapellis colorless and 15 - 45 µm thick, with ungelatinized subpellis yellowish and 135 - 200 µm thick; filamentous, undifferentiated hyphae 1.8 - 6.5 µm wide, branching, densely packed, subradially arranged, sometimes with slightly thickened walls; vascular hyphae 2.2 - 17.0 µm wide, common to plentiful, branching, sometimes tightly coiling in part, best seen in scalp. pileus context protolog: filamentous, undifferentiated hyphae 2.8 - 14.8 µm wide, plentiful to dominant, frequently branching, loosely interwoven, only infrequently in fascicles, with walls thin or up to 0.8 µm thick, often constricted at septa, with occasional slightly inflated intercalary segments up to 15.0 µm wide; acrophysalides plentiful, elongate to narrowly clavate, up to 121 × 34 µm, with walls thin or up to 0.8 µm thick; vascular hyphae 3.5 - 15.0 µm wide, common, sinuous, occasionally branching; clamps not observed. lamella trama protolog: bilateral, with shallow angle of divergence; wcs = (50-) 60 - 85 µm when rehydrated well; subhymenial base containing numerous intercalary thin-walled inflated cells [clavate or obclavate to ellipsoid (up to 48 × 21 µm) to fusiform or elongate or allantoid (up to 85 × 20 µm) to (rarely) globose (e.g., 23 × 22 µm)]; filamentous, undifferentiated hyphae 1.5 - 11.0 µm wide, branching, with plentiful intercalary partially inflated to subfusiform to fusiform to broadly fusiform to clavate cells in central stratum (up to 52 × 17.5 µm or larger, becoming disoriented rather easily by sectioning); divergent, terminal, inflated cells not observed; vascular hyphae 2.0 - 4.8 µm wide, sinuous, observed in only one mount (Solheim 5259)—rare. subhymenium protolog: wst-near = 40 - 75 µm when rehydrated well; wst-far = 70 - 100 µm when rehydrated well; frequently branching and rather tangled structure of short uninflated or partially inflated hyphal segments and small inflated cells, with basidia arising mostly from uninflated to partially inflated hyphal segments or from uninflated to slightly inflated branched elements, with basidia arising occasionally from small inflated cells; clamps infrequent to rare. basidia protolog: 36 - 83 × 7.8 - 17.8 µm, thin-walled, 4- or occasionally 2-sterigmate, with sterigmata up to 8.0 × 5.0 µm; clamps and proliferated clamps scattered (most often found near pileus margin), infrequently locally common. universal veil protolog: On pileus: as on stipe base except exterior surface layer sometimes missing, often with much of remainder partially gelatinized; filamentous, undifferentiated hyphae in narrower fascicles than at stipe base and with diameter up to 16.2 µm, with tip cells often somewhat inflated; inflated cells up to 150± × 42 µm (almost always less than 65 × 40 µm), common to plentiful, often badly collapsed. At base of stipe, exterior surface: filamentous, undifferentiated hyphae 1.8 - 8.8 µm wide, partially gelatinized to gelatinized, sometimes with walls slightly thickened, almost always in thick criss-crossing fascicles, with occasional slightly inflated terminal segment (up to 10.8 µm wide); vascular hyphae not observed. At base of stipe, interior: filamentous, undifferentiated hyphae 1.8 - 14.5 µm wide, frequently branching, dominating, almost always in broad fascicles, with walls up to 1.0 µm thick, with some branches out of fascicles loosely coiling, occasionally having yellowish subrefractive walls; inflated cells unevenly distributed, occasionally in loose clusters (rather commonly in Trueblood 5472), terminal, sometimes dissociated, hyaline, colorless, with walls thin or up to 1.0 µm thick, pyriform to subpyriform to broadly clavate to clavate to elongate-constricted to subfusiform to ellipsoid to ovoid to subglobose, up to 101 × 68 µm (almost always not more than 60 × 40 µm); vascular hyphae not observed; clamps not observed. At base of stipe, inner surface: filamentous, undifferentiated hyphae 1.8 - 10.0 µm wide, branching, in densely packed thin layer, longitudinally oriented, partially to extensively gelatinized, fasciculate, often with thickened walls; vascular hyphae 5.0 - 8.5 µm wide, in scattered fragments, partially gelatinized. 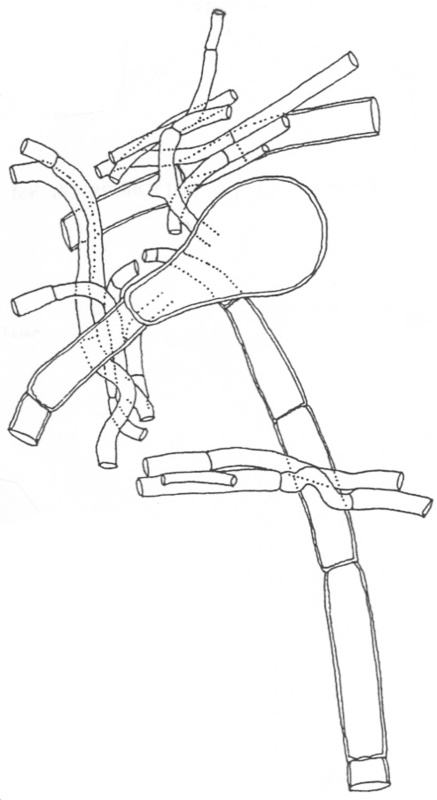 stipe context protolog: longitudinally acrophysalidic; filamentous, undifferentiated hyphae 2.8 - 9.1 µm wide, with thin or slightly thickened walls, very frequently branching, often in rather robust fascicles, plentiful to dominant; acrophysalides plentiful, up to 264 × 42 µm, with walls thin or up to 0.5 µm thick; vascular hyphae 4.5 - 11.2 µm wide, sinuous, scattered, locally common; clamps not observed. lamella edge tissue not described in protolog. 1. 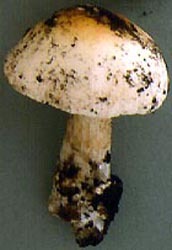 Amanita populiphila (holotype), elements of hymenium, subhymenium, and subhymenial base. 2. Amanita populiphila (holotype), elements of internal layer of universal veil from stipe base. composite from all material revised: [1180/60/23] (7.0-) 9.2 - 12.5 (-21) × (6.0-) 8.5 - 11.2 (-15.8) µm, (L = (9.8-) 10.1 - 11.9 (-12.2) µm; L’ = 10.9 µm; W = (9.0-) 9.1 - 10.7 (-11.1) µm; W’ = 9.8 µm; Q = (1.0-) 1.04 - 1.20 (-1.61); Q = (1.06-) 1.08 - 1.15 (-1.19); Q’ = 1.11), hyaline, colorless, smooth, thin-walled, inamyloid, subglobose, occasionally globose, occasionally broadly ellipsoid, infrequently lachrimiform or langeniform, very rarely ellipsoid, often adaxially flattened, often expanded at one end; apiculus sublateral to lateral, small, truncate-conic to cylindric; contents monoguttulate; white in deposit. ecology Scattered to gregarious to "occurring in hundreds." Québec, Canada: Under Populus. U.S.A.: Colorado: At 1700± m elev. Under Populus alba and P. sargentii in low grassy area. Idaho: At 1900± m elev. Under Populus tremuloides with (Solheim 5259) or without (Trueblood 5472) nearby conifers. Pottawatomie Co., Kansas: At 313-315 m elev. August, 1990: occurring in hundreds (possibly with several mycelia each producing 25 - 150 basidiomes) covering several acres in mowed field (within flood plain) under P. deltoides; with similar large fruiting in September, 1989 (no voucher); with May, 1991 fruiting producing no more than 50 basidiomes; with no fruiting in August, 1991; in 1992 (with plentiful rainfall and cool weather) fruitings starting in mid-May, with close to 2000 basidiomes present simultaneously (probably from twenty or more separate mycelia) by early June; with fruiting reduced to several hundred fresh basidiomes in third week of month; with fruiting continuing with reduction in number and size of basidiomes until only twenty found on 27 June. [Between 1 July and 25 July 1992, area had 28.8 cm of rain.] 25 July 1992, 200 basidiomes counted (most smaller than usual); 29 July, 1992, about 100 fresh basidiomes in main fruiting area with scattered specimens in two other nearby sites. [Temperatures began to rise in late July, 1992 and became very hot in first week of August.] 2 August, 1992, in continuing rain, about 200 basidiomes found in several sites. 8 August, 1992, about 150 basidiomes (most smaller than usual) total for all sites. [During mid-August, weather remained hot and became dry.] 18 August, 1992, 12 basidiomes in main area of occurrence, with 3 in distant site and these with darker than usual disc; 22 August, 1992: no fruiting bodies seen. [July 1992 rainfall (33.6 cm) was third highest recorded for that month for eastern Kansas region in Twentieth Century.] Michigan: On moss at edge of bog (Smith 50210). Minnesota: In dark soil of old lake bottom, under P. tremuloides or in sparsely wooded area containing P. tremuloides, Juniperus, and plentiful young buckthorn (Rhamnus) scrub. New Mexico: In sod of pasture with Populus sp. [?fremontii] nearby (Barrows 1090) or in dark wet loam of riparian habitat at 2410± m elev. with P. tremuloides, Abies, and Acer negundo among low cover including "cow parsnips," Rosa, and Spirea (Tulloss 8-15-92-A). Wyoming: In grassy area, under P. tremuloides. [Note: Previous citation of Minnesota habitat did not refer to populiphila. See A. sp-MN03. material examined CANADA: QUÉBEC—Région Montérégie - Châteauguay, 1.vii.2008 Raymond McNeil 86 (RET 447-1, nrITS & nrLSU seq'd.). U.S.A.: COLORADO—Arapaho Co. - Littleton, Ketring Pk., N of Ketring Lk. [39°36’31.2” N/ 104°59’58.63” W, 1700± m], 18.viii.1997 J. Justice, E. Jacobson, M. Shaw & R. E. Tulloss 8-18-97-A (DBG ?? ; RET 266-9, nrITS & nrLSU seq'd.). IDAHO—Fremont Co. - Targhee Nat. For., 6.6 km W of Idaho/Wyoming state line, 2.viii.1957 W. G. Solheim 5259 (paratype, MICH). Owyhee Co. - Vulcan Crk., 7.vii.1973 Ellen & Ted Trueblood 5472 (paratype, MICH). KANSAS—Ellsworth Co. - NE of Ellsworth, SW of Westfall, W of St. Rte. 156, E-bound rest stop on I-70, ca. mile 224, 10.ix.2008 R. E. Tulloss 9-10-08-A (RET 423-2, nrITS & nrLSU seq'd.). Pottawatomie Co. - N of Manhattan, Tuttle Creek St. Pk., River Pond Area [39°15'05" N/ 96°35'30" W, 314 m], 11-13.viii.1990 W. R. & E. Moses s.n. [Tulloss 8-11/13-90-EM1] (paratype, RET 035-8, nrITS seq'd. ), 25.viii.1990 W. R. & E. Moses s.n. [Tulloss 8-25-90-EM1] (paratype, RET 036-1, nrITS seq'd. ), 25.v.1991 W. R. & E. Moses s.n. [Tulloss 5-25-91-EM1] (paratype, RET 047-3), 15.v.1992 W. R. & E. Moses s.n. [Tulloss 5-15-92-EM1] (holotype, NY; isotype, RET 119-1), 22.v.1992 W. R. & E. Moses s.n. [Tulloss 5-22-92-EM1] (paratype, RET 60-4), 25.v.1992 W. R. & E. Moses s.n. [Tulloss 5-25-92-EM1] (paratype, L; paratype, RET 060-7), 30.v.1992 W. R. & E. Moses s.n. [Tulloss 5-30-92-EM1] (paratype, RET 103-6, nrITS & nrLSU seq'd. 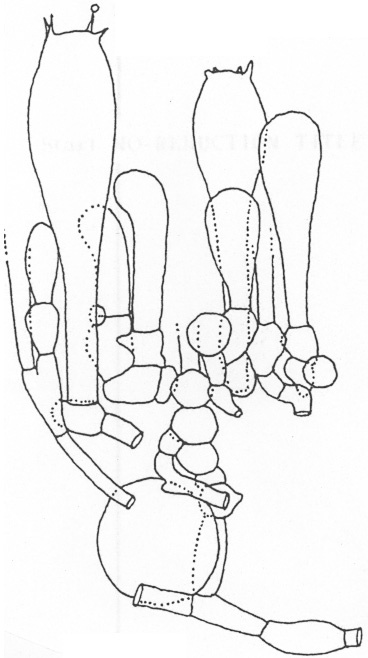 ), 5.vi.1992 W. R. & E. Moses 1 (paratype, NY), 2 (paratype, RET 103-3, nrITS & nrLSU seq'd. ), 3 (paratype, RET 103-4, nrITS & nrLSU seq'd. ), 4 (paratype, RET 103-5, nrITS & nrLSU seq'd.). Rooks Co. - Stockton, 1.ix.1908 Elam Bartholomew s.n. (paratype, FH as "A. nivalis"). Unkn. Co. - unkn. loc., 18.vi.1967 Harbaugh 67-6-18-1 (paratype, MICH). MICHIGAN—Luce Co. - Tahquamenon St. Pk., 22.viii.1965 Alexander H. Smith 50210 (paratype, MICH). Oakland Co. - Highland Recreation Area, 22.vii.1973 A. H. Smith 84263 (paratype, MICH). MONTANA—Gallatin Co. - Bozeman, divide btwn. Bridger & Kelly Cyn., 2.vii.1957 F. B. Cotner 570039 (paratype, MICH). NEBRASKA—Dawson Co. - ca. 2 km E of Cozad, Cozad W-bound Rest Stop, I-80, 2.ix.2008 R. E. Tulloss 9-2-08-A (RET 423-6). NEW MEXICO—Colfax Co. - Colin Nesblett Wildlife Area, Tolby Creek [2410± m], 15.viii.1992 NAMA ‘92 foray participant s.n. [Tulloss 8-15-92-A] (paratype, RET 068-7, nrITS seq'd.). Rio Arriba Co. - El Rito, viii.1959 Charles Barrows 1090 (paratype, MICH). PENNSYLVANIA—Northampton Co. - Blue Mountain, Game Lands 168, off Old Grade Rd. [40.83025° N/ 75.35626° W, 271 m], 4.viii.2012 David Wasilewski s.n. [Tulloss 8-4-12-F] (RET 506-5, nrITS & nrLSU seq'd.). WYOMING—Teton Co. - Grand Teton Nat. Pk., Reid Mtn., 26.viii.1983 Kent H. McKnight & Meinhard Moser [McKnight 83082610] (paratype, BPI as "A. alba"). Bacterial cloning has not been attempted with A. populiphila sequences. An LSU sequence (GenBank HQ539724) obtained from RET 266-9 and reported in (Wolfe at al., 2012) includes additional apparent variation. However, a recently derived nrLSU from RET 266-9 is completely consistent with the other nrLSU sequences from A. populiphila as described above. The Minnesota paratype collection (RET 096-5) produced nrITS and nrLSU sequences that are distinctive and that possible species is currently treated under the temporary code A. sp-MN03. Upon review of the data available regarding sp-MN03, the nonconforming collection was found to have spores significantly smaller than those of A. populiphila. photo RET - (1-2, 4) Colin Nesblett Wildlife Area, Colfax County, New Mexico, U.S.A.; (5) after heavy rain, Nebraska, U.S.A.
RET - anatomical figs. 1-2.
select a collection to review/add spore measurements..#701187. W. R. & E. Moses, #s.n.=>Tulloss 8-11/13-90-EM1, U.S.A., KANSAS, Pottaw..#701188. W. R. & E. Moses, #s.n.=>Tulloss 8-25-90-EM1, U.S.A., KANSAS, Pottawato..#701189. W. R. & E. Moses, #s.n.=>Tulloss 5-25-91-EM1, U.S.A., KANSAS, Pottawato..#701190. W. R. & E. Moses, #s.n.=>Tulloss 5-15-92-EM1, U.S.A., KANSAS, Pottawato..#701191. W. R. & E. Moses, #s.n.=>Tulloss 5-22-92-EM1, U.S.A., KANSAS, Pottawato..#701192. W. R. & E. Moses, #s.n.=>Tulloss 5-25-92-EM1, U.S.A., KANSAS, Pottawato..#701193. W. R. & E. Moses, #s.n.=>Tulloss 5-30-92-EM1, U.S.A., KANSAS, Pottawato..#701194. W. R. & E. Moses, #1, U.S.A., KANSAS, Pottawatomie Co., N of Manhattan,..#701195. W. R. & E. Moses, #2, U.S.A., KANSAS, Pottawatomie Co., N of Manhattan,..#701196. W. R. & E. Moses, #3, U.S.A., KANSAS, Pottawatomie Co., N of Manhattan,..#701197. W. R. & E. Moses, #4, U.S.A., KANSAS, Pottawatomie Co., N of Manhattan,..#701208. NAMA ‘92 foray participant, #s.n.=>Tulloss 8-15-92-A, U.S.A., NEW MEX..#701210. Kent H. McKnight & Meinhard Moser, #s.n.=>McKnight 83082610, U.S.A., WY..#708617. Anna Gerenday, #9307, U.S.A., MINNESOTA, Washington Co., Afton#708676. Larry Evans, #s.n., U.S.A., MONTANA, Crested Butte Co., unkn. loc.#713173. Raymond McNeil, #86, CANADA, QUÉBEC, Région Montérégie, Châteaugua..#724585. W. R. & E. Moses, #s.n.=>Tulloss 8-11/13-90-EM1, U.S.A., KANSAS, Pottaw..#724586. W. R. & E. Moses, #s.n.=>Tulloss 8-25-90-EM1, U.S.A., KANSAS, Pottawato..#724587. W. R. & E. Moses, #s.n.=>Tulloss 5-25-91-EM1, U.S.A., KANSAS, Pottawato..#724588. W. R. & E. Moses, #s.n.=>Tulloss 5-15-92-EM1, U.S.A., KANSAS, Pottawato..#724589. W. R. & E. Moses, #s.n.=>Tulloss 5-22-92-EM1, U.S.A., KANSAS, Pottawato..#724590. W. R. & E. Moses, #s.n.=>Tulloss 5-25-92-EM1, U.S.A., KANSAS, Pottawato..#724591. W. R. & E. Moses, #s.n.=>Tulloss 5-30-92-EM1, U.S.A., KANSAS, Pottawato..#724592. W. R. & E. Moses, #1, U.S.A., KANSAS, Pottawatomie Co., N of Manhattan,..#724593. W. R. & E. Moses, #2, U.S.A., KANSAS, Pottawatomie Co., N of Manhattan,..#724594. W. R. & E. Moses, #3, U.S.A., KANSAS, Pottawatomie Co., N of Manhattan,..#724595. W. R. & E. Moses, #4, U.S.A., KANSAS, Pottawatomie Co., N of Manhattan,..#724608. Raymond McNeil, #86, CANADA, QUÉBEC, Région Montérégie, Châteaugua..#724643. W. R. & E. Moses, #s.n.=>Tulloss 8-11/13-90-EM1, U.S.A., KANSAS, Pottaw..#724644. W. R. & E. Moses, #s.n.=>Tulloss 8-25-90-EM1, U.S.A., KANSAS, Pottawato..#724645. W. R. & E. Moses, #s.n.=>Tulloss 5-25-91-EM1, U.S.A., KANSAS, Pottawato..#724646. W. R. & E. Moses, #s.n.=>Tulloss 5-15-92-EM1, U.S.A., KANSAS, Pottawato..#724647. W. R. & E. Moses, #s.n.=>Tulloss 5-22-92-EM1, U.S.A., KANSAS, Pottawato..#724648. W. R. & E. Moses, #s.n.=>Tulloss 5-25-92-EM1, U.S.A., KANSAS, Pottawato..#724649. W. R. & E. Moses, #s.n.=>Tulloss 5-30-92-EM1, U.S.A., KANSAS, Pottawato..#724650. W. R. & E. Moses, #1, U.S.A., KANSAS, Pottawatomie Co., N of Manhattan,..#724651. W. R. & E. Moses, #2, U.S.A., KANSAS, Pottawatomie Co., N of Manhattan,..#724652. W. R. & E. Moses, #3, U.S.A., KANSAS, Pottawatomie Co., N of Manhattan,..#724653. W. R. & E. Moses, #4, U.S.A., KANSAS, Pottawatomie Co., N of Manhattan,..#724698. J. Justice, E. Jacobson, M. Shaw & R. E. Tulloss, #8-18-97-A, U.S.A., C..#724702. R. E. Tulloss, #9-10-08-A, U.S.A., KANSAS, Ellsworth Co., NE of Ellswor..#724727. J. Justice, E. Jacobson, M. Shaw & R. E. Tulloss, #8-18-97-A, U.S.A., C..#724776. Anna Gerenday, #9307, U.S.A., MINNESOTA, Washington Co., Afton#724783. Kent H. McKnight & Meinhard Moser, #s.n.=>McKnight 83082610, U.S.A., WY..#734407. Kent H. McKnight & Meinhard Moser, #s.n.=>McKnight 83082610, U.S.A., WY..#734413. R. E. Tulloss, #9-10-08-A, U.S.A., KANSAS, Ellsworth Co., NE of Ellswor..#734463. Kent H. McKnight & Meinhard Moser, #s.n.=>McKnight 83082610, U.S.A., WY..#737170. NAMA ‘92 foray participant, #s.n.=>Tulloss 8-15-92-A, U.S.A., NEW MEX..#739979. W. R. & E. Moses, #s.n.=>Tulloss 8-11/13-90-EM1, U.S.A., KANSAS, Pottaw..#739980. W. R. & E. Moses, #s.n.=>Tulloss 8-25-90-EM1, U.S.A., KANSAS, Pottawato..#739981. W. R. & E. Moses, #s.n.=>Tulloss 5-25-91-EM1, U.S.A., KANSAS, Pottawato..#739982. W. R. & E. Moses, #s.n.=>Tulloss 5-15-92-EM1, U.S.A., KANSAS, Pottawato..#739983. W. R. & E. Moses, #s.n.=>Tulloss 5-22-92-EM1, U.S.A., KANSAS, Pottawato..#739984. W. R. & E. Moses, #s.n.=>Tulloss 5-25-92-EM1, U.S.A., KANSAS, Pottawato..#739985. W. R. & E. Moses, #s.n.=>Tulloss 5-30-92-EM1, U.S.A., KANSAS, Pottawato..#739986. W. R. & E. Moses, #1, U.S.A., KANSAS, Pottawatomie Co., N of Manhattan,..#739987. W. R. & E. Moses, #2, U.S.A., KANSAS, Pottawatomie Co., N of Manhattan,..#739988. W. R. & E. Moses, #3, U.S.A., KANSAS, Pottawatomie Co., N of Manhattan,..#739989. W. R. & E. Moses, #4, U.S.A., KANSAS, Pottawatomie Co., N of Manhattan,..#740030. J. Justice, E. Jacobson, M. Shaw & R. E. Tulloss, #8-18-97-A, U.S.A., C..#788196. F. B. Cotner, #570039, U.S.A., MONTANA, Gallatin Co., Bozeman, divide b..#788197. #ENDFONT OLIVEFONT, U.S.A., MONTANA, #788198. R. E. Tulloss, #9-2-08-A, U.S.A., NEBRASKA, Dawson Co., ca. 2 km E of C..#788199. #ENDFONT MAGENTAFONT, U.S.A., NEBRASKA, #788200. NAMA ‘92 foray participant, #s.n.=>Tulloss 8-15-92-A, U.S.A., NEW MEX..#788201. Charles Barrows, #1090, U.S.A., NEW MEXICO, Rio Arriba Co., El Rito#788202. Kent H. McKnight & Meinhard Moser, #s.n.=>McKnight 83082610, U.S.A., WY..#788229. Raymond McNeil, #86, CANADA, QUÉBEC, Région Montérégie, Châteaugua..#788230. J. Justice, E. Jacobson, M. Shaw & R. E. Tulloss, #8-18-97-A, U.S.A., C..#788231. Larry Evans, #s.n., U.S.A., COLORADO, Gunnison Co., Crested Butte#788232. W. G. Solheim, #5259, U.S.A., IDAHO, Fremont Co., Targhee National Fore..#788233. Ellen & Ted Trueblood, #5472, U.S.A., IDAHO, Owyhee Co., Vulcan Creek#788234. R. E. Tulloss, #9-10-08-A, U.S.A., KANSAS, Ellswort..#788235. W. R. & E. Moses, #s.n.=>Tulloss 8-11/13-90-EM1, U.S.A., KANSAS, Pottaw..#788236. W. R. & E. Moses, #s.n.=>Tulloss 8-25-90-EM1, U.S.A., KANSAS, Pottawato..#788237. W. R. & E. Moses, #s.n.=>Tulloss 5-25-91-EM1, U.S.A., KANSAS, Pottawato..#788238. W. R. & E. Moses, #s.n.=>Tulloss 5-15-92-EM1, U.S.A., KANSAS, Pottawato..#788239. W. R. & E. Moses, #s.n.=>Tulloss 5-22-92-EM1, U.S.A., KANSAS, Pottawato..#788240. W. R. & E. Moses, #s.n.=>Tulloss 5-25-92-EM1, U.S.A., KANSAS, Pottawato..#788241. W. R. & E. Moses, #s.n.=>Tulloss 5-30-92-EM1, U.S.A., KANSAS, Pottawato..#788242. W. R. & E. Moses, #1, U.S.A., KANSAS, Pottawatomie Co., N of Manhattan,..#788243. W. R. & E. Moses, #2, U.S.A., KANSAS, Pottawatomie Co., N of Manhattan,..#788244. W. R. & E. Moses, #3, U.S.A., KANSAS, Pottawatomie Co., N of Manhattan,..#788245. W. R. & E. Moses, #4, U.S.A., KANSAS, Pottawatomie Co., N of Manhattan,..#788246. Elam Bartholomew, #s.n., U.S.A., KANSAS, Rooks Co., Stockton#788247. Harbaugh, #67-6-18-1, U.S.A., KANSAS, Unkn. Co., unkn. loc.#788248. Alexander H. Smith, #50210, U.S.A., MICHIGAN, Luce Co., Tahquamenon Sta..#788249. A. H. Smith, #84263, U.S.A., MICHIGAN, Oakland Co., Highland Recreation..#823745. Larry Evans s.n. , #s.n., U.S.A., COLORADO, Gunnison Co., Crested But..#823775. J. Justice, E. Jacobson, M. Shaw & R. E. Tulloss 8-18-97-A , #s.n., U..#823779. W. R. & E. Moses, #s.n.=>Tulloss 8-11/13-90-EM1, U.S.A., KANSAS, Potta..#823780. W. R. & E. Moses , #s.n.=>Tulloss 8-11/13-90-EM1=>Tulloss 8-25-90-EM1,..#823781. W. R. & E. Moses, #s.n.=>Tulloss 5-25-91-EM1, U.S.A., KANSAS, Pottawat..#823782. W. R. & E. Moses, #s.n.=>Tulloss 5-15-92-EM1, U.S.A., KANSAS, Pottawat..#823783. W. R. & E. Moses , #s.n.=>Tulloss 5-15-92-EM1=>Tulloss 5-22-92-EM1, U...#823784. W. R. & E. Moses, #s.n.=>Tulloss 5-25-92-EM1, U.S.A., KANSAS, Pottawat..#823785. W. R. & E. Moses, #s.n.=>Tulloss 5-30-92-EM1, U.S.A., KANSAS, Pottawat..#823786. W. R. & E. Mose, #s.n.=>Tulloss 5-30-92-EM1, U.S.A., KANSAS, Pottawato..#823787. W. R. & E. Mose, #2, U.S.A., KANSAS, Pottawatomie Co., N of Manhattan, ..#823788. W. R. & E. Mose, #3, U.S.A., KANSAS, Pottawatomie Co., N of Manhattan, ..#823789. W. R. & E. Mose, #4, U.S.A., KANSAS, Pottawatomie Co., N of Manhattan, ..#823801. David Wasilewski, #s.n.=>Tulloss 8-4-12-F, U.S.A., PENNSYLVANIA, North..#823824. Raymond McNeil, #86, CANADA, QUÉBEC, Région Montérégie, Châteaugua..#823825. J. Justice, E. Jacobson, M. Shaw & R. E. Tulloss 8-18-97-A , #s.n., U..#823826. W. G. Solheim, #5259, U.S.A., IDAHO, Fremont Co., Targhee National For..#823827. Ellen & Ted Trueblood, #5472, U.S.A., IDAHO, Owyhee Co., Vulcan Creek#823828. R. E. Tulloss, #9-10-08-A, U.S.A., KANSAS, Ellswor..#823829. W. R. & E. Moses, #s.n.=>Tulloss 8-11/13-90-EM1, U.S.A., KANSAS, Potta..#823830. W. R. & E. Moses , #s.n.=>Tulloss 8-11/13-90-EM1=>Tulloss 8-25-90-EM1,..#823831. W. R. & E. Moses, #s.n.=>Tulloss 5-25-91-EM1, U.S.A., KANSAS, Pottawat..#823832. W. R. & E. Moses, #s.n.=>Tulloss 5-15-92-EM1, U.S.A., KANSAS, Pottawat..#823833. W. R. & E. Moses , #s.n.=>Tulloss 5-15-92-EM1=>Tulloss 5-22-92-EM1, U...#823834. W. R. & E. Moses, #s.n.=>Tulloss 5-25-92-EM1, U.S.A., KANSAS, Pottawat..#823835. W. R. & E. Moses, #s.n.=>Tulloss 5-30-92-EM1, U.S.A., KANSAS, Pottawat..#823836. W. R. & E. Mose, #s.n.=>Tulloss 5-30-92-EM1, U.S.A., KANSAS, Pottawato..#823837. W. R. & E. Mose, #2, U.S.A., KANSAS, Pottawatomie Co., N of Manhattan, ..#823838. W. R. & E. Mose, #3, U.S.A., KANSAS, Pottawatomie Co., N of Manhattan, ..#823839. W. R. & E. Mose, #4, U.S.A., KANSAS, Pottawatomie Co., N of Manhattan, ..#823840. Elam Bartholomew, #s.n., U.S.A., KANSAS, Rooks Co., Stockton#823841. Harbaugh, #67-6-18-1, U.S.A., KANSAS, Unkn. Co., unkn. loc.#823842. Alexander H. Smith, #50210, U.S.A., MICHIGAN, Luce Co., Tahquamenon Sta..#823843. A. H. Smith, #84263, U.S.A., MICHIGAN, Oakland Co., Highland Recreation..#823844. F. B. Cotner, #570039, U.S.A., MONTANA, Gallatin Co., Bozeman, divide ..#823845. #ENDFONT #823846. R. E. Tulloss 9-2-08-A , #s.n., U.S.A., NEBRASKA, Dawson Co., ca. 2 k..#823847. #ENDFONT MAGENTAFONT, U.S.A., NEBRASKA, #823848. NAMA ‘92 foray participant, #s.n.=>Tulloss 8-15-92-A, U.S.A., NEW ME..#823849. Charles Barrows, #1090, U.S.A., NEW MEXICO, Rio Arriba Co., El Rito#823850. ENDFONT , #s.n., U.S.A., NEW MEXICO, #823851. David Wasilewski, #s.n.=>Tulloss 8-4-12-F, U.S.A., PENNSYLVANIA, North..#823852. #ENDFONT MAGENTAFONT, U.S.A., PENNSYLVANIA, #823853. Kent H. McKnight & Meinhard Moser, #s.n.=>McKnight 83082610, U.S.A., W..